Greece’s sports minister promised to take ‘bold decisions’ on Monday after the owner of soccer team PAOK went onto the pitch while apparently armed to protest over a disallowed goal during a match with another Greek team, AEK. Ivan Savvides, one of Greece’s richest men, walked into the pitch during an interruption in the match on Sunday night in Thessaloniki when referee Georgios Kominis disallowed a goal from PAOK’s Fernando Varela in the 89th minute. Until then the match had been a goalless draw. 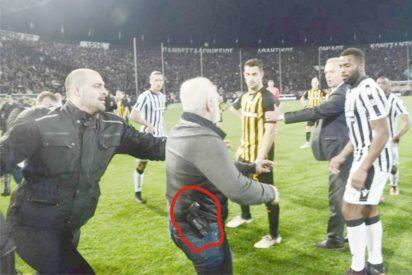 Savvides, who was accompanied into the pitch by bodyguards, wore a holster on his waist containing what appeared to be a revolver, though he did not remove it during the ensuing fracas. The referee finally allowed the goal about two hours later, state TV reported. Images of “persons entering sports grounds armed” harm PAOK and soccer in general, Greek Deputy Culture and Sports Minister Georgios Vassiliadis said in a written statement on Monday. “Such extreme phenomena call for bold decisions,” he said, without elaborating. Greece’s state broadcaster ERT said one option being considered was suspending first division fixtures. “We will not allow anybody to deter us from this path, even if tough decisions are required in consultation with UEFA,” Vassiliadis said. Savvides was born in Georgia of Greek heritage and is a former member of the Russian parliament. He has holdings in assets ranging from Thessaloniki port to tobacco and media companies. Greek soccer fixtures are frequently marred by violence. A derby between PAOK and Olympiakos Piraeus was called off last month after Olympiakos coach Oscar Garcia was hit by a roll of paper thrown from the stands. Authorities say they are committed to cleaning up the sport. The post Greece vows ‘bold decisions’ on soccer after PAOK boss enters field armed appeared first on Vanguard News.